The Sydyru Bone is a legendary crafting material used by Blacksmight Haedrig Eamon to craft the Sydryu Crust (2-Hand Legendary Bow). The Sydyru Bone is a randon drop off the Plague Carrier (rare spawn) named Sicklefang. Create a normal-difficulty Adventure-mode game. Go to the Act I: Fields of Misery waypoint. Locate the Forsaken Grounds and talk with the Beleaguered Farmer. He starts the quest titled Carrion Farm. Kill the four Plague Nest. The last plague nest will auto-spawn Sicklefang where the plague nest was located. If no Sydyru Bone drops, keep creating new games until it happens. Took me about 20-30 attempts. Note: The Forsaken Grounds (farm) is a random location and sometimes it won’t spawn. If you see burning houses, or hills with roads — the quest Carrion Farm won’t spawn. Simply leave the game and create a new one. The Sydryu Crust blacksmith recipe dropped for me from Ssthrass (who also drops Iron Wolves Doctrine). I’m uncertain if this bow recipe is part of his loot table or simply luck. 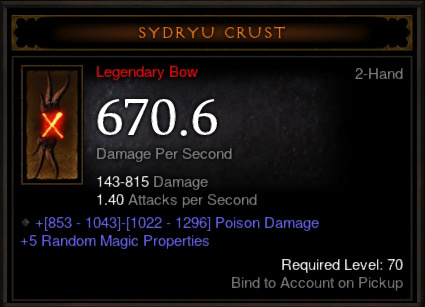 In order to craft a Sydryu Crust, you require a Doubleshot (2-H bow, white quality).